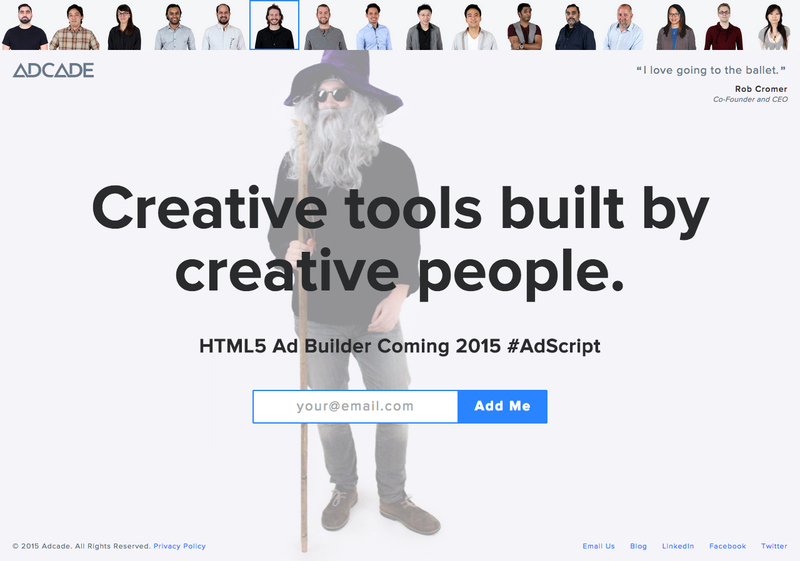 Launching soon page for ‘Adcade’ – an upcoming platform to create HTML5 ads. To show more personality behind the brand they have the whole team along the top of the page and you can click the employee thumbnail to learn more about them. It’s awesome that there is a random team member featured on page load and I really like how the CEO is not listed as thumb #1 but amongst his team. I bet company culture is important to ‘Adcade’. We built this site to feature the team that is building our software. Our company is working on launching a creative authoring platform for HTML5 ads. As the company is building creative tools, we thought it would only be appropriate to showcase the creative people. The photos were captured during a team outing where we rented a studio and encouraged everyone to let out there "goofiness" and it certainly came out in the pics that were taken.